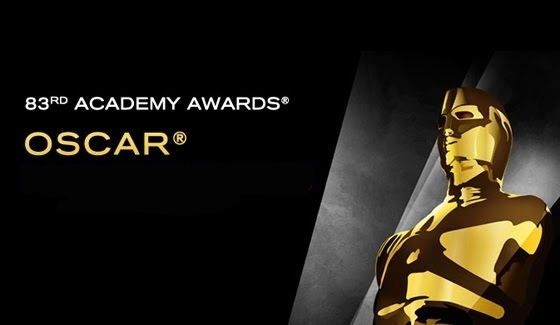 The Academy Awards ceremony is over and the statuettes have been given all away exactly to who we thought might win… Once again, Oscar disappoints in originality, courage, boldness, and predictability reigned. But in most cases what was to be expected was also the best available choice. If you really asked me Toy Story 3 should have won and Christopher Nolan should have been recognized at least as a screen-writer, or even better as a director for what was one of the most inventive and original film of the year: Inception. Instead the Academy opted for the most obvious Tom Hooper: his directing on “The King’s Speech” was showy, obvious, by number and lacked of any subtlety (you can see read my review, which was written long before the film even got released). Is this guy really worthy of standing in the same league as Steven Spielberg, Clint Eastwood, Peter Jackson, Roman Polanski,Oliver Stone, Milos Forman, Francis Ford Coppola, Robert Wise, George Cukor, Billy Wilder, Martin Scorsese, Vincente Minnelli, David Lean, John Ford, Michael Curtiz, just to mention a few? And yes, of course, Colin Firth was good, but was he really better than James Franco in 127 hours, a film that was entirely dependent on him stuck in a hole? No, he wasn’t. However he deserved the Award last year for “A Single Man” and even Colin himself knows that (that’s why he thanked Tom Ford in his speech). The Social Network, even though that too was a flawed movie, felt more like a solid piece of film-making. Well, you can obviously tell I am a bit disappointed…. Oh well, that’s the way it is. The King’s Speech joins the list of Oscar winner crowd-pleasing films, like Shakespeare in Love or Crash, Ordinary People, Driving Miss Daisy and so on. Films that found themselves at the right time in the right place and got away with winning (Let’s face it, even the Hurt Locker last year). Not bad ones, but not that great either. On the whole this was one of the lamest show in the last few years. James Franco was under-used and Anne Hathaway she felt stiff and was confined by a silly, bitty, and unfunny script. Few nice moments but that’s about it, just nice: Natalie Portman’s speech, Colin’s Speech (though he has been better before), Melissa Leo cursing and droppping the “F” bomb at one point (hahaha), Christian Bale showing that he has got a heart and that nerd guy who got the Oscar for the short film who said “I should have got a haircut”. On the whole a pretty forgettable show, with very forgettable hosts. Beautiful performance and a well deserved Oscar. A very showy performance, but still a good one. Also Christian redeemed himself for all the bad he did, by getting moved and giving a nice speech.I just hope that beard is there for some reason! I knew it the moment I saw the fighter. I haven’t seen this yet, but it’s winning awards left and right… I’m getting curious. Was there any other choice? This should have got the Best feature film too!! mmm.. Not so sure, really. A tilted tree is really not enough for getting an Oscar. But then again, it was the easiest and laziest choice. This was a surprise, but a very welcome one. It was certainly a harder film to light that True Grit. However Rogers Deakins will have to win sooner or later. Both this and the previous award are very very hard to differentiate for me, so it’s good to see them going to the same film. 20 nominations for Randy Newman and this is only his second win. Also it brings the Oscar count to “2” for this wonderful film, so I’m just happy for it. The most original score for sure. Totally deserved!! The only redeeming feature of that film. Pity for “Exit through the gift shop” which was an extremely entertaining doc (and it would have been good to see who would have collected the award). But this one was clearly a better one. Clearly this was some of the best edited film (especially if you’ve seen the special feature on the DVD). 127 Hours was a more flashy one and slightly more interesting, but they say that the best editing is the invisible one. Well, was there really anything else? To conclude, the only thing I am pleased about is that a little film like The King’s Speech once again follows the a trend set in the last couple of years whereby small, indie movies do better than Hollywood biggies… But hey, they could have done the same thing just by rewarding “Black Swan” or “Blue Valentine” or even “Animal Kingdom”.